The planting of shrubs is a great way to enhance the look of a yard. Yet with any sort of garden addition comes a new army of insects to invade and wreck havoc. There are flowering shrubs that don’t attract buzzing bees though. With a little research and the right kind of soil, a beautiful bee-free landscape can be created. Azaleas are a member of the Rhododendron family and their name means “the royalty of the garden.” These plants work in different types of environments and are fairly easy to maintain. There are many varieties of azaleas including both deciduous and evergreen types. The deciduous types tend to be more sensitive to higher heats. According to the Azalea Society, these plants tend to start sustaining damage at temperatures above 86 degrees Fahrenheit. These plants do best when planted where they can receive both sunlight and shade; the Azalea society suggests planting them by a tree. Those that are planted in full sun tend to have shorter limbs and have blooms that do not last as long. These plants don’t attract bees because they bloom earlier in the season and bees are not yet out looking for pollen. Some varieties bloom as early as February while others don’t bloom until September, in general azaleas bloom between March and June. Juniper bushes are a wind pollinated plant. These types of plants are generally not attracted to bees because there is nothing for them to pollinate. The berries from these plants can be used for adding spice to foods and juniper is the main flavoring in gin. Plants like juniper are extremely low maintenance to grow. Their height tends to be around six feet, but their width varies from six to 25 feet depending on the variety. 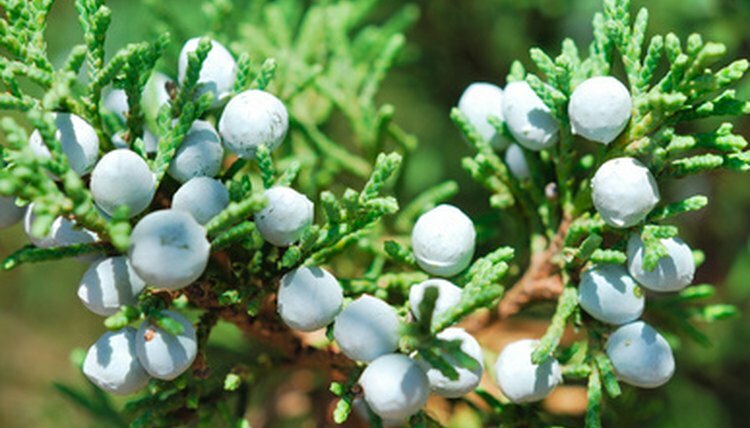 According to the website Nature Hills, juniper bushes thrive when they are in full sun and have well drained soil. In addition to their easy nature, junipers don’t need much pruning and work to keep weeds down and prevent soil erosion. These plants provide shade and a natural barrier provided they have enough room to grow. The witch hazel shrub is flowering plant that grows in the Southern half of the United States. Although this is a flowering shrub its late blooming season, late October through early December, causes it not to attract bees. According to the US Forestry Service, witch hazel grows well in moist, shaded areas. Although it generally grows wild in wooded areas, witch hazel can easily be adapted for the home. When planting it at home it should be put in the north facing side of the house and regularly watered. They also do not start flowering until they are six years old. When it flowers witch hazel grows bright yellow flowers. Witch hazel is also commonly used in natural medicine and balms.